The MyAccount Portal offers an enhanced presentation for Customer Administrators to manage multi-site enterprises. It provides a simple dashboard view to see aggregated call activity and quick overview of inventory information across the enterprise. It also provides easy to use tools to view and manage site and user based features and services. Plus, a Service Assurance section gives an indication of call quality at each site which can be used for proactive management to find and fix issues before they are severe. The MyAccount Portal provides both an Enterprise level view and a Site level view for the management of Services and User Features. The Enterprise Level shows a consolidated listing of all Services and Features across the entire company. Site level views show Services and Features for a specific company location. Note: For businesses that operate with 100% remote workers, a site could represent a group of remote workers. From the drop-down menu, select your Site. 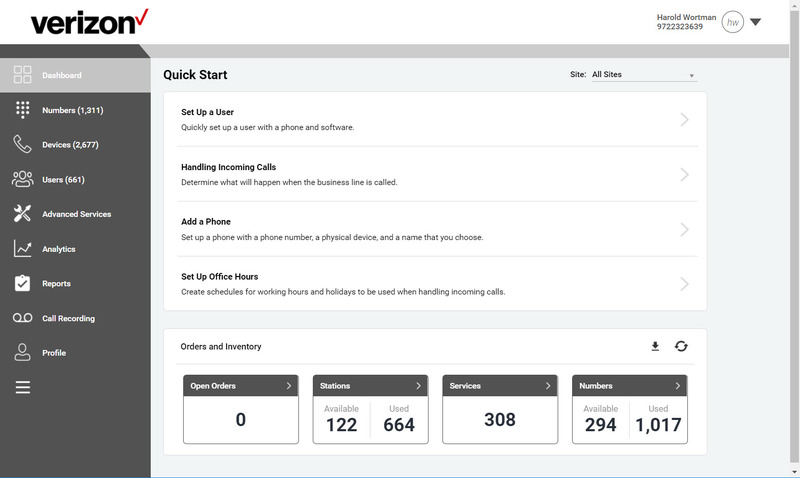 The Dashboard displays quick view of orders and inventory. The Numbers section allows you to view a list of phone numbers, devices and services. The tabs across the top of the page display lists by number and service. List by Number – Displays telephone numbers provisioned on the Site. From here you can assign numbers to services or unassign a service type from a number. List by Service – Displays a list of Services provisioned for your site. You can configure the Services for a specific number on this page. The Devices section displays a list of physical devices in your inventory. You can manage lines, pull line state inventory and assign devices to users. You can also manually enter new device information from orders on this tab. The Users section displays a list of users assigned to phone numbers. You can edit user information and manage user level features such as call forwarding, share/monitoring capabilities and station enhancements. Note: These features may vary depending on the services that have been provisioned for you Site. The Analytics section displays call activity and provides tools to quickly sort and view call by various types and dates. The top of this section displays a graph that charts the number of calls and minutes based on your search criteria. The Profile section allows you to view and update site information. The Contact Info tab displays the Site information including the site type, contact name, address, phone number, fax number and email. The Additional Info tab contains the service provider site-specific brandable fields and are only visible if configure by the service provider in the service provider portal and set as viewable. The My Numbers tab lists the telephone numbers provisioned on the site as well as number type, configured name, station type and address. This tab also provides the ability to change the main number of the site through the submission of an order. The Upgrade/Downgrade tab provides the ability to change phone number types. When a change is submitted, an order is created, which is worked through the service provider’s provisioning process. During the provisioning process, both BroadCloud and the PSTN provider’s system is updated to reflect the new number type. The Change Directory Listings tab shows the main site directory listing that may be changed or directory listings that may be added for other telephone numbers on the site.